And you build a sauna? - Yes, we are building a sauna - parilki. - If you have in mind the high humidity in the sauna room - yes, we install equipment with steam. How much does it cost sauna 2 2 meters? - Depends largely on the material that you choose. And the wall can only be internal or edge on both sides, and the quality of siding may be different, lezhaki also can be made from different materials at a price, and the ceiling height varies. You easily call (095) 786-26-33, answer a few questions about your future sauna and get an accurate answer. You almost certainly will make it. After all, a sauna in our time must be accessible to everyone. But if we do not answer your question - in low-cost version of about 85 thousand rubles. How long will you build a sauna? - Since the beginning of installation - 5 - 7 days. - Yes. 1 year warranty on the sauna. You can count the number of necessary materials?- Yes, we can do it. To do this you need to send the size of the premises at dezign@saunadann.ru or call us at (095) 786-26-33, and tell us the size of sauna facilities. How to choose a stove? - An oven that you host in the sauna, should be able progret amount of your sauna to the desired temperature. Similarly, it is essential that you liked it. For more details, see the recommendations and options for stoves to look at electric heater. In short, some kilowatts per cubic meter. - To contract for the construction and a separate contract for the service. What is the best wood for interior design sauna? - At the sauna are several kinds of wood - low-tar and low thermal conductivity, for example, alder, linden, Abasha, cedar. Index - the quality of processing. Most often used lime or Canadian cedar on the wall, but on the shelves - Abasha. How to choose a door - a glass or wooden? As for the shelves better - Abasha or lime? - Abashi ( "African oak) - low thermal conductivity. Originally, according to modern legend, the Finns built shelves of different types of wood. Then they drew attention to packaging, which from Africa to the imported goods - notably Abasha, "African oak - not GREET, quality wood - excellent. Steel book African wood shelves. Then other countries picked up. Good fast prizhivaetsya. What is the voltage necessary to have in the sauna? - If your sauna heater is up to 6 kW inclusive - is 220 volts. If the power of the heater above - requires 380 volts. And as any sauna is built? 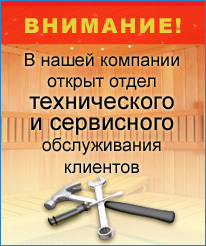 - If you already have experience in the construction of saunas - but rather simply. The framework, insulation, sheathing, ventilation, electrical wiring, beds, lighting, a few strokes and you're done! Therefore, it is better to consult specialists. And as fever should go to the sauna? - Nearly as in the picture. And we have a large glass! If you're in the sauna project provides a large window or glass door that leads to a certain teplopoteryam, you need to buy oven sauna at a rate of 1.5 kw per 1 cubic meters volume. It is likely that variants estimates - three. Just you did not notice lists - look in the lower left corner there are headlines sheets "Economy Class", "business class" and "class luxury"